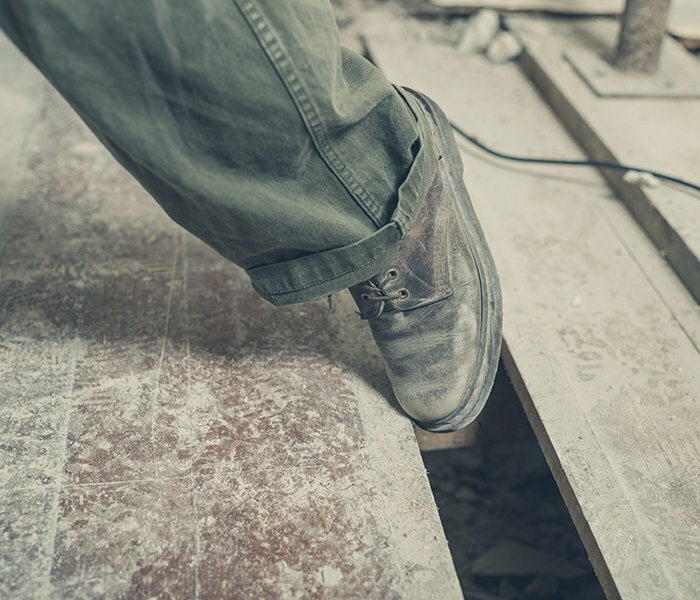 Premises liability usually refers to accidents such as slip and fall, trip and fall, ceiling collapses, and other incidents on sidewalks, inside apartment buildings, and other dwellings. In order to determine whether you may have a viable premises lawsuit, it is important to contact an experienced New York City slip & fall lawyer at (866) ATTY-LAW. Some types of cases are covered under the law and some are not. For example, a trip and fall due to a raised or uneven sidewalk adjoining a large apartment building will most likely be covered under New York’s Administrative Code 7-210 which places responsibility for a defective sidewalk on the adjoining landlord. But in other cases, the law may not protect the injured individual. If someone falls in the middle of a roadway while crossing the street and is not sure of the cause of the fall, the lawsuit will most probably fail. How do slip and fall accident happen? Slip, trip, and fall accidents happen because of unsafe conditions on the pedestrian walkway. They can occur inside a shopping mall, apartment building, sidewalk, or any place people walk. Landlords and property managers have a duty to keep their premises in a reasonably safe condition. Failure to do so may make them liable for a slip, trip, and or fall incident. Slip and Falls usually refers to a fall on a transient condition such as water, oil, wax, wet paint or a similar substance. Slip and fall usually refer to a fall due to a permanent defect such as a hole or misleveling in the walkway. An example is a hole in the floor of an apartment building, a chipped step on a staircase, or a raised portion of the sidewalk on a city street. One common element running through all premises liability actions is the concept of notice. Notice means that the landlord, management, or other party you allege is responsible for the accident had to know about the defective condition at issue. There are a few types of notice. Actual notice means someone actually notified or told the defendant about the condition and they failed to fix it. In the example of a ceiling collapse, actual notice would be the tenant writing a letter to the landlord or management of his building complaining about a ceiling leak and cracks. If 1 month went by with no remedial action followed by a collapse, the tenant would be able to prove actual notice. Constructive notice means that the defendant should have found the condition and fixed it using reasonable care. Constructive notice can be inferred from the fact that the condition was in existence for a substantial period of time. In the same example, if the tenant never complained about the ceiling collapse but the ceiling in his living room was yellow, stained, leaking, and cracked for a 3 months it can be argued that the landlord should have constructive notice of it. This is especially true if the landlord came in to look at the ceiling and or perform inspections or maintenance in the apartment. Another example of constructive notice may be a puddle in a parking lot. If a store patron sees a puddle on his way into a supermarket, then shops for 1 hour, and slips on the puddle on his way out, it may be argued that the supermarket or parking lot landlord had constructive notice of the puddle since it existed for 1 hour and they never found it or cleaned it up. The fact that the defendant does not find or fix the defective condition means they were negligent. The last type of notice is called caused and created. Even if a defendant did not have actual or constructive notice of a condition, they may be liable if they caused and created the very condition complained of by the plaintiff. For example if a janitor is mopping the floor with soapy liquid and leaves puddles or spots in different areas without putting up signs or blocking the area off in any way and someone slips and falls on the wet spot, it can be argued that the janitor caused and created the condition. So even though no one complained about the wetness and the wet spot was only present for a few seconds, the defendant may be liable since the janitor created the wet condition. Frekhtman & Associates represent those who are injured due to negligence of New York City Municipal Authority. Call NY Municipal Attorney now for a free legal consultation if you are injured and seeking justice in any type of premise accident. The most common case against New York City is a trip and fall due to a defective pedestrian sidewalk. In 2003, the law changed with the enactment of NYC Council Law 7-210 which transferred legal liability from the City of New York to adjoining landowner. Prior to 2003, a person who fell due to a defective sidewalk would usually sue the City of New York. After 2003, this same person will usually sue the adjoining landowner in front of whose property he or she was caused to fall. There is an exception for one, two, or three family owner occupied homes meaning trips and falls in front of these premises are still the liability of New York City. The most important thing to remember with respect to New York City claims is that a Notice of Claim setting forth details of the accident must be filed within NINETY (90) days of the accident. A lawsuit must be filed within 1 year and 90 days of the accident. Often the City of New York will schedule a hearing pursuant to General Municipal Law section 50(h), known as a 50(h) hearing wherein an attorney will conduct a brief question and answer session with the claimant which is similar to a deposition. After the 50(h) hearing has been held, a lawsuit may be filed. If no 50(h) hearing is requested within 30 days of filing the Notice of Claim, a lawsuit may be filed. With respect to New York City sidewalk cases, it is important to order a Big Apple Map which can be obtained from the New York City Department of Transportation pursuant to the Freedom of Information Law or FOIL. The map shows markings and a legend identifies what type of defect each marking represents. Defects include a raised sidewalk, broken curb, uneven sidewalk, hole or hazardous depression, pothole, and a number of other defects. A map can also be obtained from the Big Apple Pothole Protection Committee which non for profit agency also provides witnesses who can interpret the map to testify at trial. Our law firm has successfully resolved cases with the City of New York. In 2008, we settled a trip and fall case on a public sidewalk where a tree caused a dangerous raise in a sidewalk flag. This defect caused our client to fall and fracture her hip. The matter was resolved for $450,000. In 2007, we also settled a cracked sidewalk case against the City of New York for $275,000. Accidents involving the New York City Transit Authority include train collisions, bus accidents, construction accidents, and slip and falls. In April of 2007, our firm won a jury verdict for $2,800,000.00 for a laborer who was installing tiles on the wall of a subway station which was being renovated from top to bottom. During his work, a large electrical light, which was poorly affixed, fell from the ceiling striking him on his head and causing a brain injury. Frekhtman & Associates has won cases against the New York City Board of Education for negligent supervision including a settlement for $100,000 in allowing a broken desk/ chair combo to remain in a classroom where a student fell to the ground sustaining injuries. In summary, there are many types of premises cases. The most common are slips and falls on liquid or transient conditions, trip and falls in holes, raised portions of the sidewalk, or objects. Ceiling collapses and other multiple dwelling accidents are also common. But premises cases include a potentially unlimited scope of different accidents. For example, someone may fall at a restaurant due to a waiter spilling some food on the floor and not cleaning it up, or fall in a store due to frayed or torn carpeting, or a rug that is uneven or rolled up, or fall due to inadequate lighting making it difficult to see. If you or a loved one has suffered a premises accident, contact the attorneys at Frekhtman & Associates for a free consultation. If you think you have been a victim of premise accident, you should contact Frekhtman & Associates for a free consultation at (866) ATTY-LAW.